With these words, the President of Mongolia, Ts. Elbegdorj, characterized Mongolia-Germany relations at the press conference, summing up his business visit to Berlin on March 28 – April 2, 2015. The history of this relationship begins on January 31, 1974, from the moment they established diplomatic relations. But until 1990 it was strictly formal, according to protocol, since all Mongolian affairs and interests were directed towards the Democratic Republic of Germany. But since 1990, with the victory of the democratic revolution in Mongolia, Germany joined in to support democratic reforms in the country, joined the movement of the donor assistance, expanded on the initiative of Japan in 1991 and began to lend to economic development and small businesses in Mongolia by allocating to it by the beginning of the 21st century a total of 170 million USD. Also, by 2000, Germany was already the leading Western European country by trade with Mongolia, with a 32 million USD trade turnover. In 2010, it increased by nearly three times and came to 109.3 million dollars. By that time 35 German companies were functioning in the country with an overall investment of 2.4 million USD. Germany provided technical and financial assistance to the development of telecommunications networks, built a recycle plant in Ulan Bator, offered loans for the construction of hydroelectric power plants, funded the work of a German-Mongolian school in Ulan Bator, etc. In 2002, Germany provided Mongolia with a preferential loan of 40 million marks, plus 8 million marks, specifically for resolving energy problems. On the whole, in the 90s alone Germany allocated 230 million marks to Mongolia, including the preferential loaning of 120 million marks, and the rest for free. In 1997, German Economy Days were held in Ulan Bator, in 1998 in Frankfurt and Cologne, in 2009 in Berlin, they held the meetings of the German investors who were ready to invest, particularly in the mining sector of Mongolia. Since October 2000, a representative office of the world renown German car manufacturer Daimler-Benz has operated in Ulan Bator, not only producing cars, but doing industrial construction. Thus one can conclude that economics play a defining role in German-Mongolian relations, that Germany is Mongolia’s leading trade-economic partner in Western Europe and it has provided Mongolia with substantial assistance. But for now, their political relations remain the priority. Noteworthy milestones in their growth and steady expansion were the visit to Germany from the first President of Mongolia P. Ochirbat in 1985, Minister of Foreign Affairs of Mongolia, N. Tuya in September 1989, German President H. Köhler on 4-6 September 2008 and, of course, German Chancellor Angela Merkel in 2011 and President of Mongolia Tsakhiagiin Elbegdorj in 2012. P. Ochirbat’s visit laid the foundation for a German-Mongolian partnership, since a joint statement on the basis of these relations was adopted. This was their first political document with a member of the European Union. During the visit from N. Tuya and directly afterwords, the first meetings between German and Mongolian businessmen were held, where they signed business contracts. Following the visit from H. Köhler, the Declaration on Partnership was signed and a comprehensive agreement on cooperation in the field of archeology and historical science as well. In accordance with the agreement, a German-Mongolian archeological expedition was formed, initiating excavations near the former Mongolian capital – Kharkhorin. The official visit of Angela Merkel to Ulan Bator on October 8, 2011 became a major event. At the talks both sides highly assessed the level of partner relations and identified promising directions for their further development, in particular, cooperation in the production of liquid fuels and the use of Mongolia’s exports of rare elements. An important intergovernmental agreement was signed on cooperation in the spheres of mineral resources, industry and technology. On March 28 through April 2, 2012, an official visit was set up from the President of Mongolia, Ts. Elbegdorj to Germany. Following the talks, a joint communique was issued. 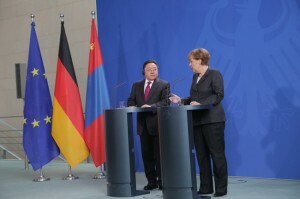 It stated the great importance of the Agreement of 2011 and the German-Mongolian Institute of Technology established in Ulan Bator in accordance with it, highlighted the prospects of cooperation in the field of mineral resources, the development of which was supposed to be reinforced by the implementation of German standards. “We agreed on increased cooperation in education, science and historical science, archaeology, and the use of these as academic and human resources,” was written in the communiqué. It should be noted that a specific feature of relations between Germany and Mongolia is special attention to cooperation in the humanitarian field, historical studies, archaeology and linguistics. It is significant that Mongolia supported the revival and development of Mongolian studies in Germany, announced a possibility of financing Mongolian organized research and training Mongolian experts in the University of Bonn, the main center of Mongolian in Germany. The fact is that throughout the twentieth century Germany has been at the forefront of the Western studies devoted to Mongolia; however, the deaths of such scientists as Erich Heynish, Herbert Franke, Walter Hayssig, Mihel Vayers Rudolf Kashevsky, Johan Schubert and other prominent scientists began to take this position from Germany. Universities began to reduce the “Mongolian étude,” in particular, because of lack of money. Therefore assistance, as Ts. Elbegdorj announced during his visit to Berlin in 2012 and reaffirmed during his working visit to Germany on March 2-4, 2015 turned out to be just what they needed. During the visit, Ts. Elbegdorj opened a major international tourist exhibition – ITB Berlin 2015m throughout which Mongolia has acted as a partner country of Germany. In general, this visit, in our opinion, was designed to bring impetus to the development of economic ties. So, lamenting in the negotiations the fact that these relations are developing not as dynamically as the political relations, and that “over the past period, both countries have failed to implement joint economic projects at the expected level,” Angela Merkel made it clear that much more effort is still needed to develop this side of the relationship. Ts. Elbegdorj stated that Mongolia would seek to cooperate with Germany in all fields and proposed to examine a possibility of concluding agreements on economic cooperation. It will also help strengthen infrastructure linkages through the establishment of a transit by Russian railways and, of course, close cooperation between airlines in Germany and Mongolia, especially Lufthansa and MIAT. At the end of his working visit, Ts. Elbegdorj met with President of the Federal Republic of Germany, Joachim Gauck in Bellevue Palace and invited him to take part in celebrations to mark the 25th anniversary of the first free democratic elections, held in July in Ulan Bator. The invitation was accepted and in the course of the conversation J. Gauck also stressed the need to enrich developing relations at the political level, including economic content. Our review would be incomplete if we did not mention the similarity of positions and cooperation between Mongolia and Germany in matters of international relations, international organizations, particularly the UN and the Organization for Security and Co-operation in Europe (OSCE), whose member Mongolia became in 2013, and the active cultural work in Mongolia since 1983 by the Adenauer Foundation – the brainchild of the Christian-Democratic Party of Germany, and its subsidiary, the Santa Moral Information Foundation, conducting ongoing monitoring of social and political life in Mongolia; as well as the Goethe-Institut branch. So, how can you characterize the German-Mongolian relations? They are politically active, friendly, and economically promising: the country with the most powerful economy in Western Europe is interested in receiving Mongolian mineral resources and Mongolia is interested in German engineering and technology. In addition, Germany is a connecting link between Mongolia and the European Union. Also, the historical memory of the Mongolians stores kind and grateful memories of the creative work in Mongolia the German engineers and technicians did in the 20s of the twentieth century, and 1% of the population of modern Mongolia knows the German language. 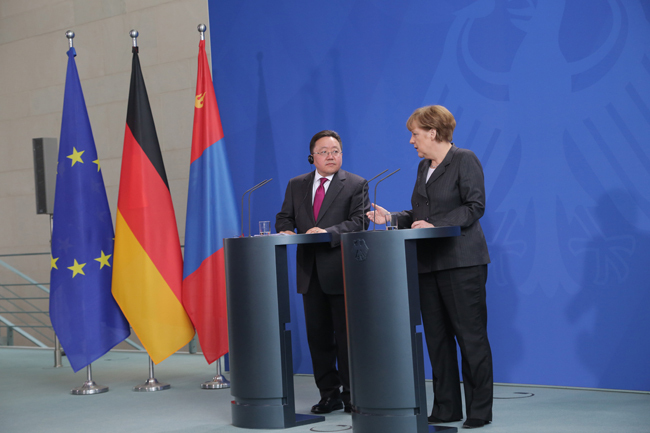 All of this is an additional guarantee of the successful development of long term German-Mongolian relations.